One of my current goals is to brew some styles new to me. Near the top of the list is a California Common, or “steam beer.” I rather like Anchor Steam, and it seems like a brew that has broad cross-appeal. For a first attempt, I thought I’d go straight for a clone of this commercial brew, based in part on a recipe I found on the AHA website, and in part on a recipe from BYO magazine (this or a similar recipe has run several times in the publication). The AHA version used pilsner malt with crystal 40 and special roast malt, whereas the BYO version used standard 2-row with just crystal 40. I figured that I would dodge the “requisite” 90 minute boil for pilsner malt and add a bit of complexity onto straight crystal 40, so the final malt bill is a combo of 2-row, crystal 40, and special roast malt. Hops and yeast are pretty much the same. As for that yeast…the vial I had for WLP810 (San Francisco Lager) was dated as “best by” mid-June, so I figured it would take a mongo starter to get things into the shape I wanted. So, I did a two-step process. First was a 1L starter, which I ran for 24 hours, cold crashed for 24 hours, ditched the supernate, and pitched the yeast into a 2L starter. This ran for 24 hours on the stir plate, and then I cold crashed it again. It was kinda fun to try out a new technique, and I suspect I’ll do it again in the future. I mashed in with 4 gallons of water at 161°, which stabilized at 151° and was down to 148° after 60 minutes. Then, I added 1 gallon of water at 190°, which raised the mash bed to 152°. I let it rest for 10 minutes, vorlaufed, and collected 3.66 gallons of wort. Then, I added 3.75 gallons of water to raise the mash bed to 160°. I let it sit for another 10 minutes, vorlaufed, and collected the remainder of the wort. All told, I collected 7.25 gallons of wort total with a gravity of 1.041. This works out to 78% efficiency. I brought the wort to a boil and added the first round of hops. After 45 minutes of boiling, I added the next round of hops. After 50 minutes of boiling, I added the Whirlfloc tablet. After 60 minutes of boiling, I turned off the heat and added the final ounce of hops. At this time, I also began chilling the beer. I was only able to get the beer down to 85° or so, so I transferred it into the fermenter at this point and let it chill in the fermentation chamber overnight to get down to 60°. 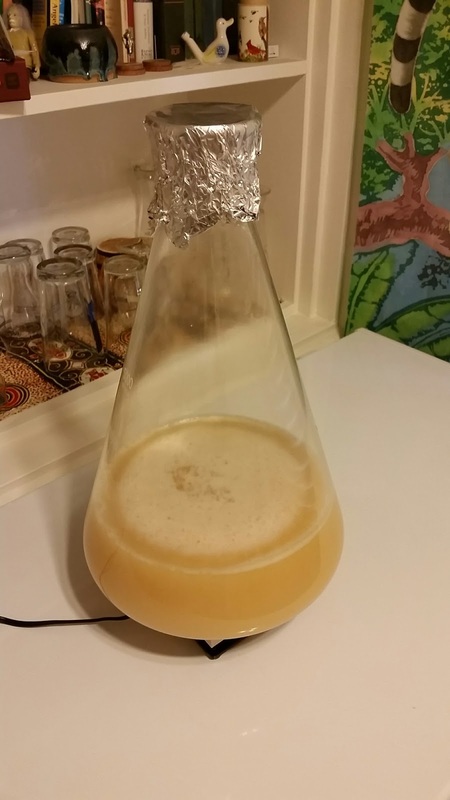 The next morning (~8 hours after transferring to the carboy, on September 12, 2015), I pitched the yeast. I’ll be fermenting at 60° for the first week of fermentation, and then will raise it to 66° to finish out. This entry was posted in steam beer and tagged CC, Clonal Common. Bookmark the permalink.